This is Portugal as you have never seen it before. From the dramatic scenery of Europe’s most south-westerly point, Sagres, we ride to the spa town of Monchique and Algarve’s highest climb, down through the hills and Valleys to Vilamoura and then up to genuinely remote countryside as we head west to the Spanish border. The route is based around the Volta ao Algarve and gives you the chance to take on the mighty Foia and Alto do Malhão. Departing from London we fly into Faro and transfer to our hotel in Sagres to set up our bikes. Our warm up day is a chance for you to stretch your legs and take in some of the dramatic coastline and undulating roads that the west coast has to offer. Towards the end we head to the striking cliffs of Cabo de São Vicente and the famous lighthouse at Europe’s most south-westerly tip, before heading back via the coastal route to our hotel in Baleeira harbour. This morning we head north on the Eucalyptus lined roads of the west coast before turning east into the quiet roads below Monchique. With the sun high at midday we loop around the beautiful turquoise waters of Odiaxere dam before heading north east into the cooler mountainous woodlands towards Monchique. This afternoon we tackle the big climb of the tour, and the highest point in the Algarve; Foia. The Volta include this in their ride every year finishing it off with a time trial back down it! On a clear day you can see the entire coastline along the south and west from the summit, which will be one heck of a reward having conquered the 874m mountain. After taking in the views, the finish calls, and heading back down the mountain past cork trees and piles of beautifully laid out cork bark we celebrate the day’s achievements in the fabulous Caldes Termal de Monchique, a spa resort nestled in the valley. Great food and wine on offer here and maybe a drop of the local hooch! 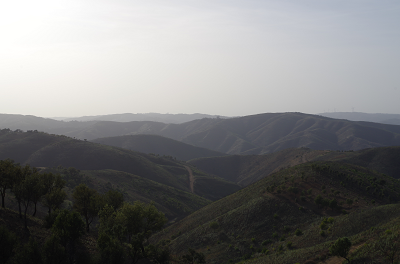 We start the day on the amazing high roads out of the fiercely beautiful landscape of the Serra de Monchique before descending into the more rolling landscape of the Silves district. The gentle rising and falling of the fertile valleys deliver gorgeous views of the orange and almond trees that line the broad hills. All being well – we’ll enjoy lunch in the town square of Silves next to the church and the castle. 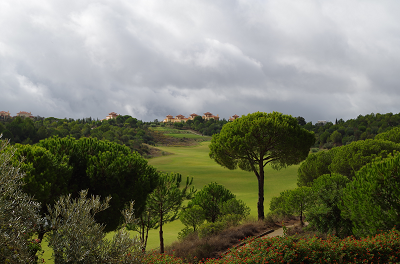 This afternoon you head south east, via São Bartolomeu de Missines and Paderne, villages dotted into the landscape that depict the charm of the Algarve’s towns, before once again meeting the coast in Vilamoura. Today finishes in a ride around the bustling marina before dinning on our penultimate night of the tour. Our final day in the saddle, and the completion of the west to east traverse of the Algarve! This morning the you take a long route north in the direction of Rocha da Pena. Skirting around the outside of the dense woodland surrounding the limestone rocks, the route takes the second big climb of the tour; Alto do Malhao. With an average gradient of 8.9% this cheeky 223m climb will certainly test the legs on the final day! Next you head towards the historic market town of Loulé with its momentous Moorish architecture, and in the afternoon you head along the road to Cachopo, a lovely village situated on the amazing Caldeirão Mountain where the Algarve’s products such as honey and cork are produced. Tavira is the last leg of the journey, an elegant fishing town, and after a short ride along the picturesque riverfront, we all head back inland to our finish and well deserved celebration meal. A morning of relaxation before transferring back to Faro for our return flight to the UK.